Chances are better than average that those who read this blog won’t themselves benefit from this information. But most IT pros have friends, family, and perhaps even co-workers or fellow staff members who could benefit from a quick-n-easy introduction to Microsoft’s latest and greatest desktop OS. 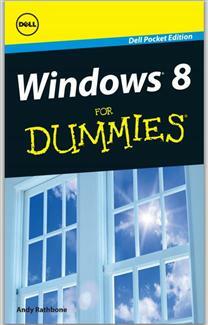 This mini-edition comes from Andy Rathbone, the author for all Windows Dummies titles back to the very first one. All it takes is visiting the download link, providing contact info (which you can make completely bogus if you like), and clicking the Submit button. Next up comes a download link to this 11 MB PDF file. Aside from brief sponsor info at the head of the book, and a one-age ad for Dell “Windows 8 optimized devices” at the very end, the material is otherwise devoid of advertising. This is what’s known as a “For Dummies custom publication” inside Wiley — I’ve written about a dozen of these myself — and it uses a smaller trim size (5.5 x 8.5″ on paper, slightly less in e-book form). So its 138 pages of actual content (not counting front matter and the concluding advertisement) aren’t as substantial as a full-size For Dummies book of the same length could be, but the content is well-written and pretty informative (as you’d expect from Rathbone, one of the most successful authors in the whole For Dummies line-up). All in all this is a nice little self-starter for those who might be inclined to greet Windows 8 with trepidation or confusion, rather than digging into help files, online guides, and other available tools to help them figure out the new desktop in record time. I figure that makes it a nice link to pass onto others who might benefit from its sometimes amusing but always helpful content. Happy Holidays!